We’ve all seen it: You walk into a convenience store and there on the counter, taped to a jar, is the photo of a child. Scrawled on the picture is an appeal to leave your change to finance a bone marrow transplant or some other treatment the child’s family cannot afford. Or maybe you can help the victim of a fire or accident by buying a pizza on the night that one dollar per sale goes to her medical expenses. Do you feel good about being able to help, or are you outraged that these families have to beg for desperately needed assistance? If you don’t feel guilty passing up such chances to help, perhaps it is because you realize the ultimate futility of such appeals. But if you don’t support doing something about it, you should feel guilty. These are neighbors in need. We can turn away from them now, but what happens when we need medical care we cannot afford? Chances are, you don’t have enough insurance to keep from going bankrupt if you get an illness or injury requiring expensive treatment. 60% of bankruptcies are due to medical bills, and 75% of those undergoing medical bankruptcy are insured. In other words, simply having insurance isn’t enough if you can’t afford to use it, or if you use it and go broke anyway. Medical bankruptcies are unheard of in other developed countries. There, risk sharing through universal health care prevents the unlucky families who most need help from having financial ruin added to their burden. Everyone contributes to the system so that none need go without care when it is needed. Aside from the humanitarian issue of having nearly 30 million Americans uninsured, most of whom are the working poor, there are many practical advantages to universal health care. When access to care is not tied to employment, it is much easier to change jobs. People are free to work where they want instead of keeping a job with medical benefits that doesn’t otherwise fit their needs. If they want to start their own business, they don’t have to worry about losing it due to unexpected illness or injury. Businesses are more competitive with overseas competitors when they do not have to pay extortionate rates for insurance and instead, have predictable costs. These costs are significantly less in countries with universal health care than they are in the American system of access through for-profit medical insurance. The financial benefits of universal health care are well known, but since some continue to claim that we cannot afford it in the US, it bears repeating: Other countries provide universal, comprehensive care for as little as half the amount per person that we pay in the US for care that is full of gaps even for the insured. 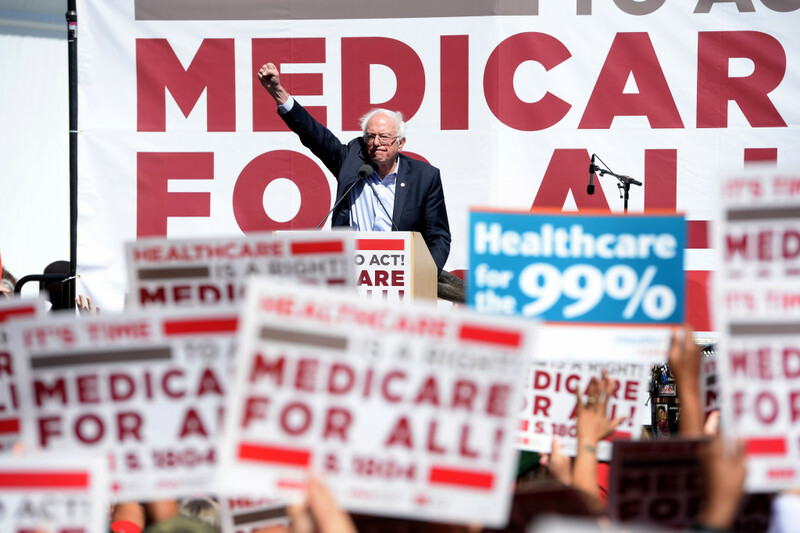 While it’s not estimated that we will save that much under the plan recently introduced in Congress by Bernie Sanders, his proposal for an improved system of Medicare for All would provide comprehensive care to every American at less cost than the current system. Such as system would have built-in cost controls lacking in the Affordable Care Act. Without such constraints, the system will ultimately become unsustainable due to the familiar “death spiral” of medical insurance: As costs rise, fewer can afford it, leading to premium increases to maintain profits, which leads to fewer being able to afford it, thus causing a new cycle of price increases. Ultimately, most of us will not be able to afford insurance without the subsidies offered under Obamacare. These subsidies amount to a bailout of Wall Street investors in the insurance industry for the sole purpose of maintaining their profits. They add nothing of value to the system to justify their siphoning 30 cents out of every health care dollar, when Medicare overhead is less than a tenth of that. When you understand the economics of universal health care, it is hard to argue that we cannot afford it. The question then becomes, do we really want to pay more for less care for ourselves and our loved ones, just to deny it to those we think may not be worthy? This article first appeared in the News-Review (Roseburg, OR) on November 17, 2017.